Selling out venues across the UK, London based grunge-pop sensation Hey Charlie have been causing quite a stir. Fresh from supporting Liam Gallagher, the all rocking trio sat down and had a chat with ROR to discuss what it's like working in the music industry and where the idea for their distinctive look originally came from. Hey HC, how’s your year been so far? Lizz: Hey, yeah it’s been good, everything’s been moving so quickly. We’ve been doing a lot of shows this year already and it feels like the years already gone by when it’s only just started. Sophie: Yeah, we released Love Machine in January or February? Sophie: March! We did a video for that which went down really well and we’ve just been gigging since then. So who’s Charlie? And where did the name come from? Sophie: The name just came because we had loads of people we knew, like a weird amount called Charlie and were always like ‘hey Charlie’ and the name just kind of grew from that. Lauren: It’s like the TV channel Dave, everyone knows a Dave. Having your head down in photos and wearing what you could almost call a uniform has become quite a familiar look with your band, are you able to discuss the thinking behind it? 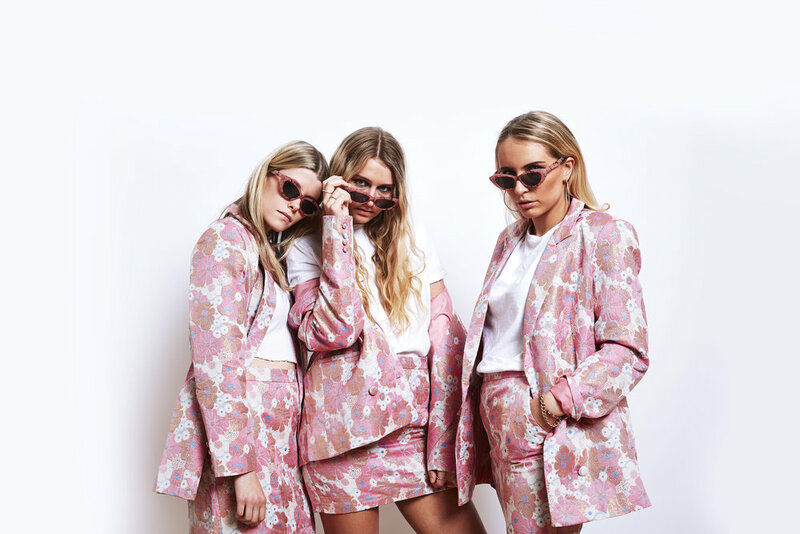 Sophie: The look originally came from when we worked with Ophelie Rondeau who is this amazing French photographer and we got the idea to match outfits from there. We feel it unites us as a band. We like to experiment with repetition and make our photos look artistic and it’s just fun and it’s also really easy because we just order the same outfit three times. Lizz: Also, for the live aspect it’s really easy for us because we have our outfit picked out that gets us in a certain mind-set before we go out on stage. It’s like putting on your uniform before you’re ready to rock. Sophie: We wanted to stand out from the crowd and it’s become a thing where you’ve got to think about your whole brand, your whole image, everything, you can’t be a band that doesn’t consider anything and just cross your fingers. We really focused on our image to a point now where we’re really happy with it. Lizz: For us it’s not just about the music, it’s the whole package. Sophie: Yeah we really enjoy co-directing our videos, writing, producing, every aspect of it is important to us. Lauren: With the hair down thing, when we released our first song we wanted a certain element of mystery and it also plays into the whole idea that we don’t have a front woman in the band so whenever we do that, nobody really knows who anyone is. Sophie: It’s pretty funny though because some people wrote a review saying that we look like something out of the horror movie The Ring and then others have described us like golden Labradors so we think maybe we’re putting out a mixed message. Lizz: It makes people immediately judge and think we’re just going to be singing and dancing when actually we just melt their faces off and it’s great. Sophie: It’s changed so much, for us as musicians it’s kind of a benefit because we’ve grown up with the changes and understand that everything now moves so fast and we can adapt to that. Whereas I think people that have worked in the industry a number of years and have the experience may not have the upper hand anymore. Lauren: I think also being in a band based in London, the city is saturated with music and people can see music every night of the week at any venue so it’s really difficult to get people down to your shows and to really commit to you and be a fan. Sophie: And there’s a massive disconnect with things like Spotify. Lizz: People just stream everything, nobody buys anything anymore, it’s a lot harder to gain and keep fans because people can get bored quickly and just want the next thing but that’s how we’ve all been raised as well with technology changing so quickly. Sophie: Everyone’s so busy and everything happens so fast that you’re connected to a million different things so it’s harder now to actually sit down and listen to an album, people just skip to the next song. Even if you write the best track in the world, you can’t just release it because nothing’s going to happen. You’ve got to be smart and creative and be able to grab people’s attention. Lauren: I think in the 60s and 70s there was so much more money in the music industry. Lizz: In rock, there’s still money in the industry but not with rock, it’s moved onto grime and pop, so that’s the other aspect for us that’s difficult because rock, although it’s not dead it’s becoming less popular in the UK so it’s hard to go against the grain and bring it back. Sophie: People connect well with genres like grime because it’s so real and because they stand for something and I guess as a rock band you want to always bring that back and stand for something and inspire kids to pick up instruments and or write songs that inspire them so they can connect with us as a band. What would be your dream if you weren’t all musicians? Sophie: I think I would love to be a photographer. I love taking photos and always taking photo of these guys. I’d want to still do something creative for sure. Lauren: For me I would love to travel, I wouldn’t be in a capital city I would be out in the sticks somewhere. Lizz: I would probably stay within music but more the business side of things like PR, Sophie and I studied business so it’d be good to put that degree into use! Do have you any records that you never get tired of playing? Lizz: I have a lot. Never Mind by Nirvana, Exile on Main Street by The Rolling Stones and The Velvet Underground, self-titled. Sophie: Mine’s probably Demon Days by Gorillaz, can’t really get bored of that. Lauren: I guess what I listen to is quite different to what we play, the albums I never get bored of are The Loved Ones by Flyte and Heartbreak Hitz by Theo Katzman. Who would you most like to go and have a beer with? Lauren: Probably Michael Jackson because it would be interesting to converse with him and find out what was going on in his head, he just created everything, fashion, music, dance, he was the pioneer of so many things. Sophie: I’m going to say Snoop Dogg. Lizz: Or is it Snoop Lion? Sophie: No he changed it back, he’s back to Snoop Dogg now but yeah that would be awesome. Lizz: Loads of shows! Which we’re super excited about, big summer coming up! Sophie: We love being on tour as well, we want to be on it all the time! Lizz: Yeah our favourite thing is to play live so if we can just do that, then that would be great.